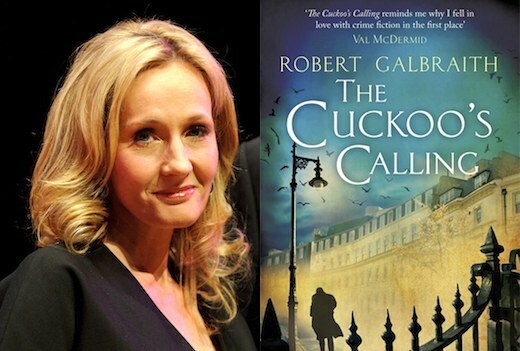 This week, author J.K. Rowling revealed she had written a detective novel, Cuckoo’s Calling, under the pseudonym Robert Galbraith. For those of you unfamiliar with J.K. Rowling, some might say she is best known as the author of the book The Casual Vacancy. Although many more might say she’s even better known as the author of the Harry Potter books. After her identity was revealed, sales of her book shot up 507,000%. 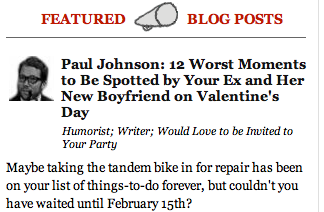 And because it’s only a matter of time before the press connects the dots, I feel it’s finally time to reveal Paul Johnson is not the author of this blog, but is in fact a pseudonym for myself, J.K. Rowling. My motivations were simple: I wanted readers to enjoy The Good Greatsby on its own merits and hopefully enjoy my humor writing not because they were familiar with my work as the author of The Casual Vacancy. And also the Harry Potter books 1-4 (5-7 were ghostwritten). My big strategic error in executing this plan came about when I began posting pictures of ‘Paul Johnson’ using a model I found on Craigslist. If I wanted people to love the site purely for the work, what possessed me to hire such a handsome man to play ‘Paul Johnson’? How would I ever begin to distinguish which readers followed The Good Greatsby because of the quality of the humor writing and how many would follow because they fell in love with this incredibly handsome imposter? For those of you who doubt my story, I ask you this: How come J.K. Rowling and Paul Johnson have never been photographed together? And what about all those tabloid rumors hinting that J.K. Rowling and Paul Johnson were an item? Turns out The National Enquirer wasn’t so far off after all. I tried hinting at my identity with Harry Potter themed posts such as Sorting Hat, Please, Please Don’t Put Me in Hufflepuff! I also hinted at my identity as the author of The Casual Vacancy by posting many, many subpar posts that people only read because they were fans of my earlier posts. And as long as we’re revealing pseudonyms, you didn’t hear this from me, but Dan Brown and Stephanie Meyer are the same person. I’m not sure which one is the pseudonym but the level of prose and the slack jaws of the readership are exactly the same. You may know Stephanie Meyer as the author of The Host. Also the Twilight books. If you’re not familiar with Dan Brown, you may know him as the singer/songwriter behind the 1993 album Dan Brown, featuring such songs as “976-LOVE.” Seriously. You may also know Dan Brown as the author of The Da Vinci Code. And for those of you hoping to publish a book, please don’t be discouraged that my book Cuckoo’s Calling only sold 1500 copies in three months despite excellent industry reviews, multiple laudatory quotes from famous mystery writers, high ratings on Good Reads, and outstanding connections in the publishing world. Also don’t be discouraged that multiple publishing houses rejected my manuscript. And if you still feel discouraged, just do what I do and think of your billions in the bank. That always cheers me up. I’m not sure how you can be J.K. Rowling, because I AM in fact J.K. Rowling! There can’t very well be 2 of us, can there? Unless we are the same person. Or siamese twins. Something is fishy in Denmark, methinks. Maybe one of us could be J.K. and the other could be JK without the periods. That sounds like a fair compromise. Your humor and satire….leaves me guffawing, every time. Awesome read! You know, I was thinking that this blog couldn’t possibly be written by a debut blogger. The high level humor and skill at the double entendre, lead me to believe that an established young adult fantasy novelist might be behind The Good Greatsby. You should have spoken up sooner. I was going to give a free castle to the first reader to guess my real identity. Darn I was the second reader! I was just about to type something incredibly witty about being a huge fan of Paul Johnson, when I got completely sidetracked by your ‘recent comments’ widget. Neil Patrick Harris is the second to last commenter. Clearly you are the real deal, J.K.
His name keeps showing up on my caller ID as well. I’ll continue to post pictures of him from time to time to keep things interesting. Are you suggesting J.K. Rowling might be a pseudonym for Harper Lee? Is that why we haven’t heard from Harper Lee for all these years? You sound sad because a well-written, well-reviewed book sold only 1,500 books in three months but then became a best seller once people found out it was written by a famous person. Clearly, you don’t understand the market. In some ways, the state of the publishing industry makes me depressed. But in other ways, the publishing industry makes me incredibly depressed. I can buy you and J.K. but Dan Brown and Stephenie? Wow! Shocking, right? But it’s encouraging to know there’s at least one less bad writer out there, isn’t it? Oh right…..the billions in the bank! How could I forget! Of course you know I’m really Stephen King, and my first three complete novels were rejected until I wrote Carrie. I only write Little Blog of Happy because who the heck would suspect Stephen King of writing a blog about being “Happy”? Unless you associate being happy with clowns. But who the hell does that? Gotta go, I hear screaming in the hall……. Mr. King could I borrow just a million, that way I will be one tenth as happy as you and Mr. Johnson, uh I mean Ms. Rowling, uh, oh I got confused because of that model guy who is posing for Mr. Johnson. It all makes sense now. You really won’t be happy until you rule the world, JK. Off to un-follow you and find Stephanie Meyer’s blog…maybe she’ll have an imposter as handsome as Paul? Oh, I forgot: I’m really Stephen King trapped in Darla’s basement. Send help. Only if she has access to Craigslist. Is it available in other cities? Y’know, J.K., now that I know who you really are, your biting sarcastic British wit isn’t working for me anymore. I lied. It’s still funny. Damn you to hell. I’m actually Mark Twain. I take really, really good care of myself. Didn’t you also double as Einstein last century? But, if Stephanie Meyer is a pseudonym for Dan Brown, how do we know that Dan Brown isn’t a pseudonym for someone else? Maybe they’re ALL J.K. Rowling! I’m Rowling! You’re Rowling! Everybody’s Rowling! It’s Rowlings all the way down! You hired a handsome IMPOSTER???? I am blown away by the level of deception that has been practiced! YOU mean that the poster of the handsome imposter I have hanging in the garage isn’t really….um….well I’m so confused, I don’t WHO he’s supposed to be anymore. He’s still supposed to be someone handsomeness so never let yourself lose sight of that. I will go get the scotch tape and put him back up…I will try to get over the trauma. Jo (can I call you Jo? ), your American accent is PHENOMENAL. I’m glad you picked that up. Not everyone fully appreciated the great lengths I went to. Fine, I’m Dorothy Parker. Rumors of my demise have been greatly exaggerated. Well played, J.K., well played. For a brief moment I thought I was J.K. Rowling after a few of my blog readers deemed me as the next up-and-coming. Those 5-seconds were the most blissful I’ve ever experienced. I knew there was no way that JK would actually canoodle with that Paul Johnson dude! He’s really not that bad once you get to know him, although that’s what other people say because I never took the time to get to know him. It was the glasses that hid your true identity. J.K. I am almost certain I saw a picture of you and Paul posing at a book signing by Robert Galbraith for the “The Cuckoo’s Calling” in The National Enquirer. Can I get it autographed? What makes you believe that J.K. Rowling is not a pen name? I used many over the years while working in the entertainment biz (since 1983). In fact, I came up with the pen name J.K. Rowling. “Malfoy is an anagram for “of Amy L”…and that is me. And J.K. Rowling is also an anagram for JK Growlin? Does that mean anything? Actually, the “J.K.” was for the initials of the two men who discovered me. I made up the name “Jo-anne” for Joe Elliott of Def Leppard and the K was for Kurt Cobain. I used their initials several times including for the stage names of Jason and Kevin Smith (Jay and Silent Bob) and then again while working on ideas for Men in Black for Agents J and K portrayed by Will Smith and Tommy Lee Jones. Tommy Lee Jones went on to portray “Two-Face” in the film “Batman Forever” which I collaborated on script ideas. This is what gave me the idea for the two faced Prof. Quirrell in Harry Potter. I borrowed the name of Ian Fleming’s character Quarrel. I’m shocked by this revelation. All this time I just assumed you were Margaret Atwood. Did you know if take the name Margaret Atwood and switch around all the letters, and then switch them back, you still get the name Margaret Atwood? Dear Ms. Rowling–I’m sure that thinking of your billions will make what I’m about to tell you easier to take. A mouthbreathing radio commentator down here said that he KNEW that you had written The Cuckoo’s Calling because he recognized the linked similes and other amateurish style characteristics that you made famous in the Harry Potter books. PS do you think you could be persuaded to tell the world that you actually wrote my book to give it a sales boost? Let me know when we can do lunch. I’m already trying to get the rumor started. I told the guy who delivered our mail but he wasn’t familiar with either you or J.K. Rowling. The reason most postal workers don’t recognize my ouvre is because they usually encounter it In plain brown wrappers. Who needs a revelation or confirmation from JK? I will settle for a rumour that she wrote my book. She should go around handing out novels and asking people to use their names, address, phone number, and housing information to publish her next book under their personas. If she ever needed someone to do that, I’m here. Anyone else get the need to sing “Can the real J.K. Please stand-up, please stand-up, please stand-up.” Man, life must be hard when you’re successful. Let’s go play some Quidditch and talk about it. As long as you are blogging under the name Paul Johnson, do you mind if I use J.K. Rowling as part of my blog’s name?